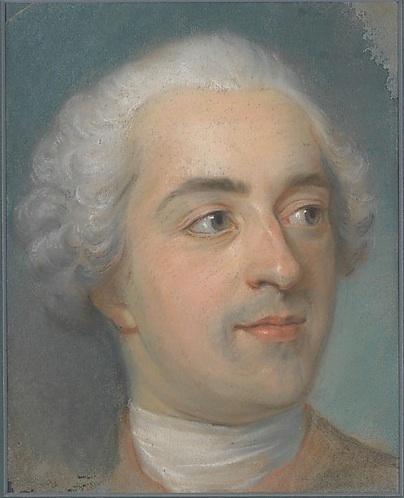 Coypel’s large 1743 double portrait – quite a masterwork in pastel, chalk, and watercolor on four joined sheets of handmade blue paper, mounted on canvas. Most of the subjects are sporting pastels, but a few are wearing brilliant hues that haven’t faded over time in the Metropolitan Museum of Art’s micro-show, Eighteenth-Century Pastels. The show is sort-of hidden away at the top of the grand stairs in Gallery 624 in the European painting galleries through December 29. It’s a confessional of sorts. The Met admits that it’s given star status to the pastel drawings of 19th-century luminaries Cassatt, Degas, and Manet for nearly a century (thank you, Mrs. Havemeyer! ), but only recently started acquiring the pastel artists who were genuinely the masters of the craft – the pastelists of the 18th century, who catered to kings and royalty. The drawings are brilliant, but the lights are dim in the gallery to preserve the fragile medium. It’s ironic that the colors still sing after hundreds of years since they’re only bits of colored dust hanging on to delicate, handmade blue paper. Check out the detail on Coypel’s lace. 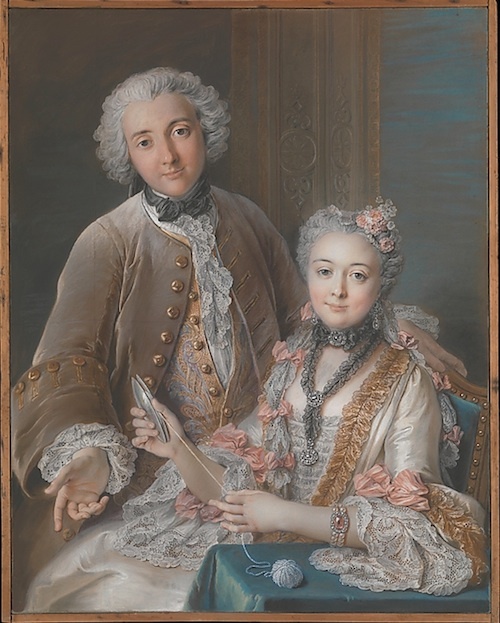 It’s why the sheer size of Coypel’s gigantic pastel/watercolor 1743 portrait of François de Jullienne and his wife is such a wonder. 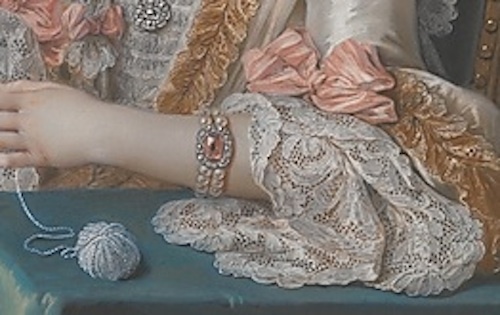 We’ve clipped some of the detail here to show how the ball of yarn, lace cuffs, and necklaces virtually leap off the paper due to their incredible detail. Is this really just a chalk drawing? No wonder that pastels at that time carried the prestige of fine oil paintings in the best homes of Europe. Although you have to peek around the other side of this panel, the Met has also given a view into how the magic happened. 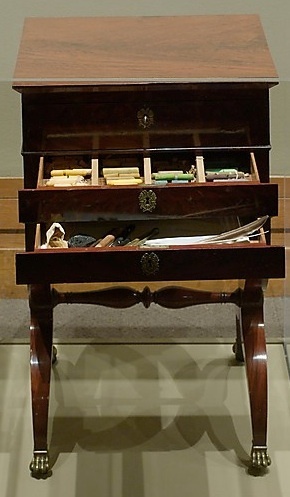 The curators display a rare 1810-20 cabinet that shows how pastel artists arranged their medium, color by color, in cabinet drawers made specifically to hold the chalk and pastel crayons. The artist would draw within arm’s length of the cabinet, reaching for whatever subtle shade he or she felt appropriate to create the lifelike illusions. The tiny show has striking works by Mr. La Tour, a favorite of Madame de Pompadour who obviously had access to the inner circle. Near a beautiful portrait of her architect hangs a small, intimate portrait of Louis XV – a preparatory work for a later portrait that shows off La Tour’s of-the-moment quality. He was known for his spontaneous life drawings, and this seemingly natural portrait shows why he received so much patronage. Apparently, La Tour had seven drawers in his studio cabinet and collected hundreds of crayons from the finest makers in Europe. Enjoy his work, Wright’s stunning black-and-white portrait of a British “girl with an earring”, and the most adorable Italian boy and girl in the world at the top of the stairs. This entry was posted in Art, Fashion, History, Museums and tagged art, drawing, history, museums, style by mssusanb. Bookmark the permalink.